Neuhaus Realty REMINDER! Please Become a Member of Our 100/100 Club to Fight Autism! 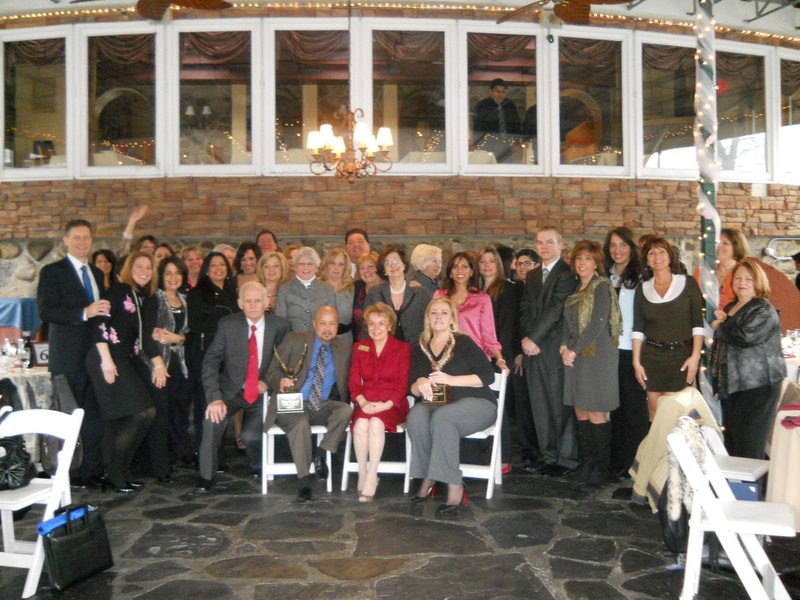 Neuhaus Realty, Inc. owner Mimi Neuhaus and her employees gathered to hold their annual awards ceremony on Thursday, March 1st, 2012. Mimi Neuhaus, broker and owner of Neuhaus Realty, recently held her agency’s annual awards ceremony at The Lake Club, a local establishment in beautiful Clove Lakes Park. The recipients of the Elite President, President, and Million Dollar Club Awards attained very high standards of excellence – standards deliberately set high by Neuhaus Realty. These prestigious awards are based on productivity levels that are determined by overall sales dollar volume combined with number of sales transactions. Every year, Mrs. Neuhaus holds this event to acknowledge the professionalism and achievements of Neuhaus’ top producers among their real estate peers. The MLS statistics confirm Neuhaus Realty has sold more homes on Staten Island than any other company for the past 16 years. There were 31 awards presented to both the New York and New Jersey Neuhaus Realty associates. “In the face of a challenging and ever-changing market place, all of our associates have maintained the highest levels of performance. Although our market has been characterized by many in only a negative light, properties are still bought and sold – regardless of economic conditions. People will always need a place to live. Our esteemed associates stayed focused and, once again, exceeded expectations,” said Mrs. Neuhaus. For the fifth time, the prestigious Eagle Award was given to Tony Ragucci, Associate Broker in the Staten Island office. Valerie Santangelo of the New Jersey office won her second Eagle Award. Mr. Ragucci started his real estate career 25 years ago at Neuhaus Realty, and a full-time, full-service broker. He is dedicated to meeting the unique and ever-changing demands of his clients and customers. With an impressive list of awards over his years – including the Staten Island Board of Realtors’ Top Producer, Neuhaus’ Elite President Club, and another Eagle Award – Mr. Ragucci proves he is a top-quality broker. Valerie Santangelo of the Holmdel, NJ office accepted the Eagle Award for a second time. A 16 year veteran, Valerie specializes in custom homes in Monmouth and Ocean counties. As the recipient of the Top Producer, Mentor of the Year and Circle of Excellence awards, her business philosophy has always been to provide the highest quality of professional service to her clients. Her business acumen and her passion about real estate are evident from the first meeting. Says Ms. Santangelo, “Real Estate is not just a career for me; it’s a lifelong passion. I understand that being a top real estate agent involves both a keen awareness of the market and the ability to really listen to a client’s needs.” Combine these skills with her friendly, patient personality and a tenacious set of negotiating skills and you will discover why she scores the highest marks from both buyers and sellers. Ms. Santangelo is a very ethical, professional, and reliable associate. Her ability help clients achieve their real estate goals and her sincerity while doing so has earned her the respect and loyalty of all who work with her. Mrs. Neuhaus also took the time to honor all of Neuhaus Realty’s past Eagle Award winners. Past winners include Lynn Ghorra, Connie Lamantia, Connie Nixon, Gale Strassberg, Monty Li, Tony Ragucci, Patty Inglese, Valerie Santangelo, and Peggy Power. The Elite President Club winners are Michael Azzato, Theresa DeCrescenzo, Patricia Falcone, Monty LI, Margaret Power, Tony Ragucci, and Valerie Santangelo. The President Club winners are Dale Chesnov, Patty Inglese, Guy Marasa, and Connie Nixon. The Million Dollar Club winners are Michele Agosta, Arlene Ajello, Debbie Arrigo, Patricia Bartelini, Giovanna Cardinale, Laura Catuogno, Nikki Chaudry, Nancy Composto, Kristina Fasullo, Kathy Feola, Lynn Ghorra, Connie Lamantia, Peggy Lennon, Neila Nuzzi, Joyce Powers, Pasquale Pucella, Donna Quarto, Carmen Santillo, Dalia Sena, Stephanie Sentine, Danuta Staporowska, Gale Strassberg, Lee Venezia, Elizabeth Walsh, Mickie Weidmyer, and Jeanne Volpe. In addition, Elizabeth Walsh was honored as Most Likely to Succeed, and Joyce Powers was honored as Best Mentor. In addition to Neuhaus Realty Inc’s yearly Awards Luncheon, the following associates applied for SIBOR’s 2011 Top Producer awards, and were recognized for their outstanding achievements. They are Tony Ragucci, Peggy Power, Guy Marasa, Monty Li, Nikki Chaudry, Donna Quarto, Joyce Powers, Dale Chesnov, and Tony Ragucci. The requirements for each level – gold, silver, and bronze – are deliberately set very high by the SIBOR Top Producer Award program. This was started in 2000 and honors achievements in productivity. These prestigious awards are determined by overall sales dollar volume combined with number of sales transactions during the year. Every Saturday morning at 10:00AM, Neuhaus Realty conducts free comprehensive training sessions for new and experienced real estate agents. Various speakers along with Mrs. Neuhaus provide valuable advice during these sessions. New associates do extremely well at this training, and they value it greatly. “There are tremendous changes in the way we go about business today. Agents coming from other real estate agencies marvel at the professional training offered at Neuhaus, which was not offered at their other companies,” says Mrs. Neuhaus. Talking about Neuhaus’ hands-on attitude, Joyce Powers said, “I worked with two other companies before joining Neuhaus Realty, after a career on Wall Street and I participate every Saturday in Mimi’s sessions.” Joyce added, “I not only learn from these sessions and other associates, but find them very uplifting. Every new idea and review of regulations is extremely helpful. I also mentor new associates who come on board. Helping people with their new careers is rewarding.” Ms. Powers was commended for being the Best Mentor at the awards luncheon. Neuhaus Realty added training to our sessions in social media, such as Facebook, LinkedIn, ActiveRain, Twitter, and YouTube, where customers and associates can connect to and view virtual tours of the extensive inventory. They also participate in “listing book”, Realtor.com, Staten Island Advance and 40 other websites. Visit our new website at www.neuhausrealty.com. More information can be found on the company’s website, www.neuhausrealty.com. The website contains a wealth of information for buyers and sellers. Neuhaus Realty has two convenient locations, both offering services for buyers and sellers of residential and commercial properties, rentals, investments, and assistance with financing. The Staten Island office is located at 3171 Richmond Road, at the intersection of Rockland Avenue, and can be reached at 718-979-3400. The New Jersey office is located at 51 E. Main Street in the heart of Holmdel, NJ and can be reached at 732-946-2911. Says Mrs. Neuhaus, “Our Holmdel NJ office is doing extremely well. We have just sold out a development of 9 new homes in Marlboro and listed a luxurious 4 bedroom colonial at 58 School Road W, which should be completed shortly. Our next construction site will be available in NJ. We can be reached there at 732-946-2911.” Both offices are open seven days a week. If you are interested in buying or selling in Staten Island, Brooklyn, or New Jersey, contact us today. Neuhaus Realty is the recognized leader in the real estate industry since 1969. We have SOLD more homes in the past 16 years than any other company on Staten Island and we have the Multiple Listing SOLD statistics to prove it.